Amazing person.....like I loved my makeup allotð superb work keep da same flow..and her attitude down to earth da best part of a person. Thanks fo da lovely 2 different looks on my big day of life. I found Nehad through a search on Instagram and boy was I so glad I did! I scrolled through just 3 posts and decided that I was getting my Nikah makeup done only by her. I immediately called her and booked her well in advance. She even drove down at 5:30am for it. Without a doubt, my makeup was flawless for the event and stayed put for a good 15 hours! She not only kept ME calm during the entire process, but also made sure the others in my family were releived of the tension. Looking forward to more events! Nehad is definitely the best make up artist one can get in Bangalore. She is extremely professional and has such great ideas when it comes to bridal looks. For my reception, I wanted a look which was completely different from the three other looks I had gotten done for the remaining functions. She made me feel very comfortable and suggested multiple looks which would fit my requirement during the trial itself. I was extremely happy with the final reception look she did on me. She is very talented and personable. I would definitely refer her to anyone who is seeking make up services for wedding functions. Thanks a lot Nehad for helping to make our day a memorable one!! Extremely talented and creative makeup artist who can create a perfect bridal look despite a lapsed makeup trial. Nehad imran is absolutely the neat and talented artist I have come across. Masha Allah her fingers deliver magic. She very well knows a bride should look like bride and not like a clay pot. She makes sure ur features are highlighted and she transforms your face in such a way that any angle of pixel can make you look gorgeous.im glad to see the price reduction..now girls are even more lucky.???? Nehad di.. thank you for that amazing look u confidently gave on my D DAY.. I had genuinely put all my trust on you from day one???????? I had met Nihad a couple of years ago and never had I thought that she'd be doing my wedding makeup. I love the way nehad made me feel so comfortable from the very first meet and I had a couple of pre wedding meets with her and I could discuss every detail of my attire and accessories with her and we discussed every look of my functions. Loved every look of mine on my all my functions. Everybody loved every detail of the makeup and its been 3 months I'm married and I still have people calling me to ask about my makeup artist. To sum it all up, I don't think I could have found anyone better than her! She's amazing at her work! Nehad made me look like a girl straight from a fairy tale. You just need to trust what nehad has to say and if she's suggesting something just go with that. If at all you want something in specific and particular just tell her and I'm certain she ll incorporate that in a beautiful way. I'll cherish my wedding day for so many reasons but one of reasons is that I'm proud of myself for choosing nehad as my makeup artist for my wedding day. My experience with Nehad was AMAZING. Starting from the trial to the wedding day, her professionalism was flawless. She really made the effort to understand my vision for the look and replicate it into reality. She has an eye for detail and is very comforting. In between all the wedding chaos, I could blindly trust on Nehad without even looking into the mirror. Needless to say, everyone loved the looks and I loved being dolled up by her! Nehad is truly an inspiration for all and I look up to her for her pure dedication towards her work. She does not leave any stone unturned to ensure that her brides are given the best desired look for their big day! Without a doubt, she is the best Make up Artist in Bangalore and for me she's the bestest in the Whole wide world! After months and months of research, discussions with various make up artists across India...to almost booking a deal...I finally came across this gorgeous lady on wedmegood who changed my decision in just no time. After seeing her work I was pretty certain she'd do a great job! From my very first inquiry, I knew we would get along really well. I immediately booked her for all three events- Shukrana, Nikah and Walima. She did a fantastic job on each occasion. Her team ensured from my hair to my make up, to setting my dupatta and jewelry, everything just turned out to be exactly how I wanted! I let her do her magic on me without any trial. I had BLIND Faith in her work. My friends and I had great fun getting ready with her and she's totally worth every penny. Nehad is honest, highly professional and very friendly which makes one fall in love with her! My friends are already in love with her work and want to book her for their big day too. All my Professional pictures have come out soo beautiful and this would not have been possible without her! Moreover, my make up lasted all night! Generally brides worry about their skin color as heavy make up might make you look slightly darker than your usual shade. So if you're looking for someone who can give you the perfect fair shade for your skin with a natural glow...stop here, because you've found it! All thanks to her for giving me the confidence and smile that I had on my big day. My guests certainly raved about how beautiful I was! Compliments just kept pouring in all day. If i could I would choose Nehad a 1000 times over! I highly recommend her to all the upcoming brides. Trust me...you will not be disappointed! She was the first choice for my wedding makeup, I loved her work as soon as I saw it online.She nailed the look I wanted,I didn't even need a trial. She has amazing makeup skills and a wonderful personality. Masha'Allah. To make your important day more special you've got to go with Ms.Nehad. She's an amazing artist. Nehad is the best makeup artist ever.. I’m very particular about each and every detail in my wedding, so obviously make up is important part. I even suggest her to my sister’s wedding.. Nehad made me much more prettier bride.. when I saw Nehad’s brides pics, I thought they were already beautiful but when I got my makeup she made me into a beautiful bride.. Well..trust me Nehad’s hands has the magic of turning ugly duckling into a beautiful swan???? I searched for almost all top makeup artists but for me Nehad is the best.. I strongly recommend her..
A big thank you to Wedmegood that I found Nehad. I wanted to choose the best makeup artist for my sister. I researched a lot and she was my very first choice. I am proud of what I chose. Every bride out there reading my review SHE'S THE BEST MAKEUP ARTIST. I strongly recommend her. As a person she's fun loving and kindest. She give her 100% for everything she does. Be it eye shadow, lipstick, base or hairstyle. So I will definitely give her five star with a hug Ps: I don know if I can say this. But I love her smile (*girl crush*) ???? Was very skeptical about choosing an MUA for my big day but once I saw her work, I just fell in love with it and knew that I would not regret this decision. thank you so much Nehad ???????????????? alhamdulillah ???????? Simply the best in town! You can just sit back and let her do the magic and you will definitely love the end result! she is experienced, relaxed, sweet and definitely a professional at her work. She is the artist who I would blindly recommend for anyone. Apart from this she is a very friendly and approachable person too! I don?t really know where to begin, but this woman is beyond brilliant at her work. She executed my looks with such perfection, it was spell bounding! I booked her for three functions and she made sure she gave me a different look for all three and also kept in mind what suited my face structure. If you?re looking for a make up artist for your big day then PLEASE BOOK HER! And I?m saying this solely because I loved her work so much !! PS- bonus is that she?s super friendly and will make you feel so comfortable! Nehad was absolutely perfect! She was on time,didn’t require any assistance with anything, knew exactly what would suit my facial features and was a breeze to work with! I was very particular about even the tiniest of details throughout my wedding and while I had to repeat myself and keep checking the work of all other vendors, Nehad was the exact opposite! She knew what she was doing, did it in a breeze and She was so reassuring! I was so calm and comfortable while she worked, I didn’t even take a peek to see myself until she finished... n O my! Everyone loved my makeup and hair! My dad who never comments on makeup for the first time ever said that he liked how she had given me such a natural finish that also brought out my best features! Honestly I didn’t want a full on heavy, face unrecognisable makeup and I had mentioned it to Nehad and she took care of it! It was so flawless n didn’t look fake! Plus it lasted more than 10 hours! The hairstyle was perfect Pakistani elegance! Best hairstyle I’ve ever had done!! So many compliments! best makeup artist ever! My experience with Nehad has been out of this world!! I have no words for every look that she gave me on each of my wedding functions.. she has magic in her hands and will transform each girl into a princess.. apart from being an amazing MUA she is also a great human being.. i cannot thank her enough for making me look like the perfect bride ?? I had a lovely experience with her.. she is one of the best MUA. can't thank her enough for making me look so beautiful on my special day.. can blindly trust her.. her work speaks volumes.. last but not the least a lovely,sweet,humble person.. All those who are looking for a MUA you definitely need to book her.. Nehad!! A beautiful lady filled with tons of talent. After being introduced by my best friend, she is that one person who i can blindly recommend to all my friends around, for her patience for her talent, for her suggestions, for her hands-on experience in the art of makeup and best of all for being there during impossible situations. My experience with nehad imran was awesome. She is a synonym for "professional". She was at my place for makeup before time. Makeup is just awesome,picture perfect. Proud to be a nehad imran bride. Nehad is truly the Best makeup artist in town.Her work is beyond expectations. Highly recommendable to everyone. She is extremely professional and she has a wonderful eye for colour. She does flawless makeup and will truly make you look like a princess on your big day. Let me start by saying, she is a lovely person , charming and very friendly . You puts a lot of effort in making you feel comfortable and has eye for details which makes working with her a memorable experience . 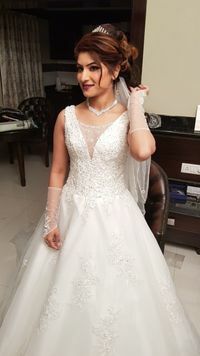 With my reception on 4 may , I some how managed to get to know about her on 3 may and it turned out to be working in my favor in best possible way . She made me look fantabulous.. As far her make up technique is considered , she customized it according to my needs. I would definitely recommend her to my friends and family ..
Best makeup artist in the town.She will truly make you look like a princess on your big day.Her work is beyond your expectations.Me and my mum took the right decision and are super duper lucky to get our makeup done by nehad.Highly recommendable to all the brides out there.Hats off for her work and her makeup will increase your confidence.In love with nehad and her make up. Awesome awesome experience with Nehad. Quality of service , timings and cost all up to the mark . I am very delighted to write about my experience with Nehad. She made me look so elegant and gave me two different look for the wedding and the reception- Like the way I always wanted. The comfort zone Nehad put me in from our first meeting was why I had made up my mind. She is professional and very passionated about her work. I would like to thank her and her team for making my day very special. The first time I met Nehad and had my makeup trial that's when I was sure that I was going into safe hands and she exceeded my expectations... THANK U SO VERY MUCH HUN for not only making me LOOK so beautiful but even FEEL so beautiful on my big day???? Best quality in you is you're a very reliable person and you make everybody comfortable around you. Wish you good luck and May God bless you and your entire family with great success and happiness. Living in United States and getting married in India, it was very hard for me to find a good makeup artist. After doing a lot of research, I finalized Nehad Imran. I must say that I was extremely happy with her work. Her eye makeup was very detailed and I loved what she had done with my hair. Everyone who saw me at the reception or my reception pictures, first thing they mentioned how well my hair and makeup was done. She was very professional and took a lot of time to find the style that best suits my features. She spent quite a bit of time understanding my likes and suggestions and used her creativity to do wonders on me. I am very thankful and so glad that I chose her as my makeup artist on my big day and will highly recommend my friends and family to Nehad Imran. I took a right decision to select Nehad as my makeup artist in my big day. She is amazing. She listened to me how I want the makeover and did a very good job. I was so happy ànd whoever came to marriage appreciated her work. I would like to thank her for making my day very special. Nehad is one of amazing person I have ever met. She had done my Nikah makeup and by my almighty I took the right decision by choosing Nehad.One year around to be completed for my marriage. Even today people compliment for my elegance. It's only because of Nehad. she made my D day more beautiful than ever I thought for.Thank u so much Nehad. My experience with Nihad Imran was amazing .she is very friendly and understanding , she has magic in her hands that can bring out the best in you . Thank you Nihad for making my special day a memorable one , love you lots???????????? I got my reception makeup done by nehad and that was the best decision I took! She is amazing at her work and her team is equally good! She is also a very warm and gentle person and makes you feel at so much ease during the whole process. I would recommend all the brides to be to stop your search and get nehad to do your makeup, trust me you’ll be a very happy bride if you do so! Lots of success to you nehad!! Thank you for making me look so so gorgeous!! Nehad is the best and one of the punctual makeup artist I have met. She is just perfect and neat. Very friendly, sweet and understanding person. She will make you look the best on your big day and mainly I had complete satisfaction and confidence. All credits to you Nehad. Thank you so much❤️. I am very happy with your work. My family and friends cannot stop gushing over the beautiful bride I looked and I can confidently say that it was all courtesy Nehad ! She made me look stunning .. she made me so comfortable and at ease. Used the best quality products as promised and my makeup was intact for 15 hours after application, despite all the tears and stuff. Cannot get over the pictures which came out after and during the getting ready shots! Loved her.. absolutely amazing !! Nehad’s work is simply amazing.! She understands client specifications very well and caters to them perfectly! It was a pleasure to be dolled up by Nehad, she makes you look and feel beautiful. Definitely recommend her to all brides, give her a try and I am rest assured she will not let you down! So glad that I picked Nehad for my big day! Her work is flawless .. she takes her time to understand her clients and what they want and delivers 100%. She made my day perfect ! Loved loved LOVED her work, made me feel so comfortable, from start to finish. Couldn't have asked for a better makeup artist. I had booked her for muhurtham and reception , nehad did an amazing job. Loved her work. She is really patient and helps you with wedding shopping and guides you the right way as to what to chose for your outfit. She is really good at her work, she does what is best for your skin tone. She was my go to person if had any doubts during my wedding. Don't miss out on the trial with her, that's where you built an amazing rapport with her. She is always there for you with any of your queries, even though she is so busy. I am really happy that I chose her as my beautician, loved her amazing work :) :). I had booked her for a wedding in the first week of December, for 2 days. For my sister (Bride), my mum and me. She is an amazing communicator which is really important and very soft spoken, accommodating. We had requested for additional services for my sister and she was able to do it. She stayed back with us at the resort so we aren't delayed the next day & save up on time & travel cost. Absolutely loved the end result - both the events on all 3 of us. Looked very natural - without it being too much. She made each of us look exactly the we pictured for ourself. Thank you very much Nehad. I loved her work..she made me look like an angel..such a sweet person she is very calm and composed..I booked her with the genies help and I'm so glad I did it..thank you for your beautiful work..
One of the best MUA in Bangalore !! Since a year I was looking for MUA for my D.Day!! When I went through Nehad di profile I instantly fell in love with her work and I wanted ONLY HER to doll me up for my wedding !! Allhamdulillah I looked my best on my wedding day !! Thank u di for letting me be ur bride the #NEHADIMRANBRIDE !!! Keep up ur good work :) I wish u all the very best and great success forever love u and ur work !! Thank you Nehad for making my special day more beautiful ???? Your work is amazing, I cannot thank you enough. Thank you for being extremely patient and honest. I am so glad I booked you. Just lovely. Just a sweet person you are. ???????????????????? Nehad apa is the Fairy God Mother who has been granted the responsibility to make every bride beautiful in their own way.. shes so precise with her job that I knew Nehad was the one, who could do makeup the way we want her to do. My experience with her was just amazing.. her exquisite hand in makeup and hair are totally superb and to die for! Love you for the for the amazing work you did on my 'The day' ! I wish for everyone to reach her for best looks for their Big Day as well.. as my husband especially loves the looks she did on my Reception day and would anytime recommend her for amazing refinement of beauty. Thanks Nehad apa.. and All the best! Nehad is everything you?d expect from a make up artist. She is professional, listens to what the bride exactly needs and makes helpful suggestions when required. I found her through all the helpful reviews on wedmegood and immediately knew she was the one I required. She was extremely helpful during our trial and answered all my questions and concerns. For the day of my wedding she was very booked but still incorporated me into her schedule She arrived on time and gave me the exact look I wanted! She?s very friendly and accommodating and for your special day I personally believe she would be the perfect make up artist. Nehad Imran ?the best? makeup artist, you can just trust her work without taking any trials before the wedding and that?s what I did. Though I?m not from Bangalore I did not even bother to take trial because I trusted her with her work and that she would make me look like a doll. I did not opt for any other makeup artist Nehad di was my first and last choice. My mom asked Nehad to do her best and make her daughter look like a doll. Hence the result was outstanding, words cannot describe her talent her dedication her outstanding job. Thank you so much Nehad do for making me look like a doll. Proud to be your bride ?Nehad Imran bride?. She was just a fairy with magic wand! I loved her work especially the hair part of it. She just nailed the look I dreamt of for my spcl day. Thanks a lot for all your encouraging words which had put me at ease even without a trial, sometimes u talk to some person & u just know u can trust the person. Thanks a lot love! Every girl dreams of what she has to look like on her big day and so did I. I?m really glad that I chose Nehad as my makeup artist because she made me look exactly what I?d always dreamt of. Nehad clearly understood my needs and delivered my dream looks on all 3 occasions. She knew what I wanted from my makeup just a few minutes after I spoke to her. I think she is the only MUA who puts in so much effort to connect with her brides and she still continues to do so even a month after my wedding. If you?re in a dilemma and don?t know whom to book for your D-day then trust me Nehad is that person. Her passion, enthusiasm and perfectionism clearly reflects in her makeover. Thank you for being so co-operative, warm and friendly and making me look like a princess ?? 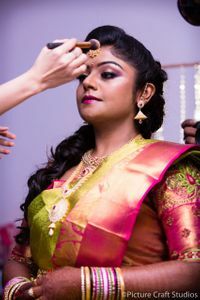 One of the best make up artists in bangalore. ?The aalia baig of bangalore? thats what i call her. She transformed me into a princess on my wedding day just lile how I had dreamt of. Thank you di for being so approachable and comsidering my feedback im everything. Stay blessed?? Nehad Nehad Nehad!! This woman has soo much positivity around her and is such a sweetheart. During my first call with her I remember I mentioned 2 things 1. I have extremely curly hair which most MUA's would think twice about on how to handle. 2. The saree drape should be on point.. Both of these were perfectly executed by Nehad and her team. As I am a no make-up girl, I was always skeptical about the wedding makeup and if I would be comfortable. Nehad has soo much patience and really went the extra mile to see to that I was comfortable and understood my needs starting from the trial till the actual wedding day. My wedding make up was beautifully done and she bought out the best of all my features. Proffesional, On Time and Amazing work!! Thank You Nehad! Cheers!! NEHAD!!! Wat can i tell about this lady... Words would never end if i write my experience with her.. Such an amazing personality.. First impression is the best and she perfectly fit in this frame.. when i really made her understand wat i need from her she never denied my concerns.. She respected, understood my needs and did exactly wat i was looking from her.. 0% attitude and friendly nature made me feel that i have reached the right place for my big day and she din let me down.. The make up perfectly suited my wedding dress and i got huge compliments.. Wana have a perfect make up for any ocassion i only n only think of nehad... You can blindly trust her work n just relax and she does the magic!!!!! I definitely recommend alllllllll ladies to get nehad for their big day and i bet you will never regret... Lots of love to you.. N thank u soooo much for dolling me up just the way i wished.. I have experience the best makeup experience with your make up studio. Staff is very good and also listen to your requirements!! I just want to let you know as a bride, I think only I will be happiest with the makeup and hairstyle. Super work guys! There only be a one thing that their make up is little loud for reception. I had fairy tale kind of dreams like anyother bride about how I wanna look on my D day and nobody could have done it lik u do it Nehad. thanks a ton for making my dream come true.. The only instruction I gave Nehad about my makeup was "don't make me white".... And the rest was history! She just needed one look at my face structure, hair length and outfit colors and she immediately knew how to transform me (a bride who barely ever wears makeup) into a pretty bride! I received a LOT of compliments on my makeup and hair, with guests also admiring how different the looks were for the western reception and traditional wedding... The groom was definitely impressed too! Nehads charming personality, constant fun chatter, and expertise in this field put me so much at ease even though that was the first day I actually met her! 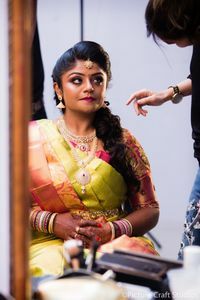 Nehad (makeup) and Geetha (hair and sari) are quick with their work and can immediately grasp what the client wants and deliver it without much interference/guidance from our end! I'd most certainly recommend her for brides and families too! You can blindly put your trust in Nehad! (Even without a trial).... Thanks Nehad for reducing my stress on those days by giving me the perfect bridal look! Nehad and Geetha were amazing. My sister, the bride, and I, got such rave reviews about our makeup, and hair. Nehad really changed up our looks for an evening reception and the day time wedding muhurtum. Such a pleasant person to be around, the day was made less stressful being around Nehad. Thank you so much for taking care of us. Nehad ua make up was the best experience ?? Amazing work! ? It is so important dat ur artist understands u nd help u get dat look for dat day of ur life dat is so vry important nd memorable. Nehad is one of the best people to have around for your wedding. Not only is she the absolute best makeup artist, she's a lot of fun and keeps the bride calm. She went above and beyond to get the perfect look. She's an artist in her work and I'd recommend her services any day. She is more than a makeup artist, she's now my friend. The best bridal makeup you could ask for! It's been a wonderful experience with Nehad, kind, caring, humourous and professional. Rest back, trust her and enjoy yourself while she turn you into a Queen. Definitely recommend !! Nehad..!! No words to describe your work..totally professional..it was perfect .. you made me look like a princess on my big day...Thank you. NEHAD !!!! thank you so much for the makeover . You are just amazing at ua work . Your patience , creative thinking , timeliness , perfection , unique at your work is just amazing . I was very happy to be ua bride . My decision to choose u as my MUA, I think that's the best thing I did . Love you so much and thank you again for making me look like a princesses . You made such an important day for me a truly beautiful one by making me up so wonderfully! Thank you! Thank you! Thank you! The many compliments I received were all a credit to your outstanding skills. Thank you for your support, kindness, and generosity. Nehad , such sweet and so amazing !! relaxed, friendly and professional, all at the same time.. and absolutely wonderful and has an amazing talent! I never knew wearing makeup could feel that good ..You made me look and feel gorgeous for my engagement. Nehad is fantabulous to work with and I highly recommend her to anyone. Nehad is a gifted artist , very professional and very polite and as well . She made sure each of my facial features were enhanced and highlighted to its best . Totalyy reliable and can blindly trust her work. She's not just an artist but also someone who connects with her brides as friends and not just clients. Wishing her loads and loads of success and would recommend to Mannyy ! Astounding, passionate about her work and simply brilliant. I've referred Nehad ,to a couple of my friends and she's never let me down , they've all been extraordinarily happy. Dedication and hardwork have superseded her efforts. Wishing you all the best and god bless. NEHAD IMRAN" actually running out of words.... I can't tell you how amazing she is..... u need to see it to believe it Still will share my experience.... I had actually been to her for just a general party makeup N I ended up in booking her for my wedding by the end of the makeup. I just spent about half n hour with her but it felt like I know her since ages.... Her hands for makeup is just marvellous..... She just turns the bride into a celebrity with so much ease. For the BRIDES' TO BE DONT THINK TWICE OR WASTE TIME IN SEARCHING FOR AN EXCELLENT MAKEUP ARTIST..... Just search for makeupbynehadimran. Love u Nehad Rachna Ahuja Asrani. "NEHAD IMRAN" actually running out of words.... I can't tell you how amazing she is. Great experience. Highly recommended. Di ! Thank you so much. Words cannot do justice to express my gratitude towards you. But I would like to take this opportunity to thank you by saying a few words. "I couldn't have felt more amazed at myself on that day! I had fairy tale kind of dreams like any other bride, about how I wanted to look on my most special day and nobody could have done more justice to making it come true, than you Nehad Di! And the most commendable part of it was that there was no compromise made by you to get the perfect look for both me and my sister inspite of the unexpected time constraint. Hats off to you. And a Big Big Thank you." PS: Love you to bits. We got Nehad reference through a family member. She exceeded our expectations and bride and family were very Happy. I recommend Nehad for others. I am not sure if words can do justice to how great Nehad's work is..She exceeded my expectations in every way and went far beyond imaginable..She is one of the best make up artist in Bangalore..She is absolutely wonderful and has an amazing talent for what she does! The best thing about Nehad is she so focused and gives importance to every detail.She has a wonderful eye for colour..respectfully listens to your requests..she is so calm collected and has a stress free attitude..She is a godsend to every bride!! I would highly recommend her to everyone..Thank you Nehad ..You are the best.. Her work, the quality and finesse is amazing And everyone I have recommended her to also loves her. She uses high quality products. Very friendly to work with. I love her work n do highly recommend. All the best Nehad. Nehad is a true friendly makeup artist. She is always ready to listen to requirements and assist to bring out the best in oneself. I had made a perfect choice to go with Nehad on my wedding,I was exactly dolled up as planned before without any disappointment . She was always on time , lots of patience, friendly yet professional and list goes on..!! She does magic on her brides with her Nature and the beautiful colour palette. Last but most important thing ...She always keep up her words.! I would love to recommend to all my friends and family ! Nehad is one of the best make artists. She is a thorough professional, very organized and most of all very patient. I used her services for my family and myself. She made each one of us look really special. She highlighted our best features and hid our flaws so beautifully that each one of us felt like Cinderellas. We really didn't want to remove our make up that day. Thank you so much. Nehad love you, you are the best, I am your fan!!! For someone who is not so fond of makeup but had no choice but to go for it instead on her special day , I loved Nehad's work on me. It was just the perfect makeup I was looking for. Nehad's a great artist and makes a personal effort to understand her brides . She ensures that her brides are comfortably gorgeous :). Atleast this happened with me and I vouch for her work. She has a lottttt of patience. Thank you nehad. Nehad is so amazing! I never ended up doing a trial with her, my schedule and flexibility just did not allow me to, but she had such wonderful raving reviews that I trusted it would be ok. And all her reviews were so right! She made me look and feel so gorgeous. Nehad is really sweet, personable and so easy to work with. She makes you feel so comfortable which is really important. You could tell from the moment you met her that she knew exactly what she was doing and that she loves her job : ) She was also very accommodating when it came to scheduling our makeup session. The best I can describe her work is that she makes you look like the best version of yourself! Nehad Imran ....she gives in 100% hard work...creativity. ..n ...pleasure into each n every woman she uses her gifted fingers on.. The charm of a woman is painted with elegance n grace....making her not only look attractive n beautiful. . .but feel it too! Love ur work Nehad...may u continue to make women more happy on their already happy occasions! Amazing make up skills..nehad is one of the most talented make up artists...!! !